The topic of how the iPhone (well, the apps) puts enormous strain on its battery hasn’t gone away, and I don’t think it will go away any time soon – unless the next iPhone actually comes with a better battery pack. So it’s not really surprising that we see battery case after battery case come out. Sometimes, you wonder how else one can modify a battery case so that it actually stands out. The guys of Twelve Monkeys Company have thought of something along these lines, although I am not too keen on the edge they are touting. The product is called Feeling Skin, and it is a battery case for the iPhone that promises to solve three common issues with existing products in the niche. The Feeling Skin detects automatically when your iPhone is running low of battery and recharge it. You can now leave your iPhone 5/5S in the Feeling Skin to both synchronize and recharge it by plugging the USB cable to the case. The App lets you see precisely how much battery left in the Feeling Skin and what you can do with it. That’s pretty convincing, actually; what I am not too sure of is the “feeling” part. 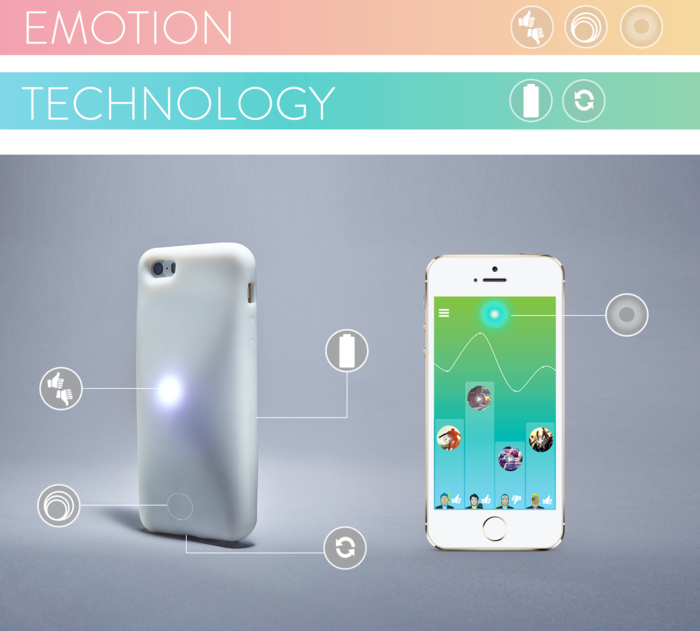 It comes with an accompanying app (of course), which shares your mood, or how you feel, with your friends. I suppose that the idea can be fun if you only use the app with your closest friends, but that can get old quickly, don’t you think? Be the judge, though, and watch this video. If you feel like sharing how your mood with others (not to mention having a new battery case), help the Twelve Monkeys Company by funding their Kickstarter Project below. Want more Apple Kickstarter products? Check out the Apple Gazette Store!